Posted by dan bertolet on	Monday, December 21st, 2009 at 12:22 am. You can follow any responses to this entry through the RSS 2.0 feed. Responses are currently closed, but you can trackback from your own site. I really appreciate the thoughtfulness and honesty you put into this article, and your willingness to challenge your own urbanist biases. I agree wholeheartedly with your analysis and conclusions. I also agree with Mumford and your analysis in your concluding paragraph. There is no shortage of reasons to reduce auto dependence. In the past I have complained about using the climate change as a ruse to push your (our) pre-existing anti-car agenda. As you can see from your own figures, if we reduced VMT to zero it would only reduce our GHG emissions by 20% and that number is unusually high because of our hydropower electricity. Across the country, if the U.S. reduced VMT to zero, it would amount to perhaps a 10% cut in GHG emissions. While every bit helps, there are certainly lower hanging fruit. I fear that pushing VMT reductions as a solution to climate change distracts both from more effective ways of reducing emissions AND from the manny other reasons to reduce VMT, but that’s a disagreement about strategy, not about objectives. Another key point that you briefly addressed in your article is the hidden emissions associated with cars, such as manufacture and road construction. I would suggest that you add the construction of structured parking to that equation. Given that there are something on the order of 5 to 9 parking spaces for every car in the city, if we start adopting a dense urban built environment, we will literally be dedicating more construction materials (and associated GHG emissions) to building parking than we will to constructing the buildings themselves, not to mention the enormous economic cost. These hidden emissions are one of the key reasons that we absolutely must put a global price on carbon, either through cap-and-trade or carbon taxes. If we attempt to reduce GHG emissions through local policies or individual behavior, we may end up making the problem worse inadvertently. With an economy wide price on carbon, charged at the source, the price will filter through the supply chain and handle all the accounting for us. Those hidden emissions in manufacturing will be embodied in the price of the vehicle, making it more expensive to purchase (and giving an incentive to not buy a car in the first place or to make the one you have last longer by driving it less). The hidden emissions of road construction will make roadbuilding more expensive and we let the taxpayer revolt solve the problem for us. The one problem a carbon price won’t solve is parking, unless it is decoupled from buildings. The carbon price will make constructing structured parking even more expensive than it is now, but if we continue to mandate parking subsidies through onerous parking minimums, or allow developers to bundle the parking with the units rather than sell it separately, it remains an enormous hidden tax and the price signal fails. I would say that if you want to push for a single urban policy that would really help the cause of solving global climate change and reclaiming our built environment from the machine, it would be eliminating parking minimums and mandating the unbundling of parking. The price signal will solve most of the other issues, but that one needs urbanists to break the stranglehold of this lingering vestige of the era of auto supremacy. Looking at the pie chart at the top, it seems to me the quickest way to reduce those three large pie slices would be (in order): density, and rail. Build tall cities, and connect them with high-speed*, high frequency electric passenger rail along with seperate high-capacity (multiple track) freight rail. Cars become unnecessary, and trucks would only be needed for local deliveries. *the high-speed bit isn’t even required – it would just be useful to compete with airplane travel. The unbundling of parking is huge – don’t know why that doesn’t get more play in Seattle. That’s allowed people to save $$ on purchasing homes in the city, both in NYC and SF. In Chicago they have “location efficient” mortgages that actually allow less-car-owning people to qualify for larger mortgages. Re: electric vehicles, don’t they charge at night, when the electric grid has lots of excess capacity? I’m no expert, but I think that reduces the additional load pretty substantially. Just sayin’. 1 MWh=1,000 kWh, correct? Therefore it would only require 1,100 MWh. Am I missing something? I agree with the point of the post, I just don’t think that math is correct. stocks? when one of the largest contributors to our region’s economy – Boeing – is is an unsustainable industry (two, if you count war), it will make us difficult to be truly sustainable. where is the discussion of what this region does as a whole? importing iPhones and plasma TVs and exporting airplanes is hardly sustainable. the problem with the City’s whole report is it only looks at a portion of our collective behaviors to assess GHG. This allows the false conclusion that reducing VMT is the key to sustainability. This then gins up the mantra of density and investment in light rail and keeps the gravy train a rollin’ for them that gets by on gravy – like the partners in the Quality Growth Alliance. Personal consumption, our social habits, and population growth are bigger issues. The way you look at this issue, the best thing the region could do to reduce GHG is stop the 1.6 million from coming here. From 2005 to 2009 commercial truck VMT up 0.636%, but commercial truck emissions up 14.08% over same period! Cook @5: good catch, my mistake, I left out three decimal points in the VMTs: it should be 3,292,031,000 miles, now corrected. The Commercial Truck share of emissions is also huge: as big as air and nearly the share of Cars and Light Trucks. It would be interesting to see the breakdown between long haul, short haul, service, and delivery trucks. I’ve read that short haul are typically very dirty. The Port of Los Angeles Clean Truck Program simply banned pre-1989 trucks as a start and reduced port pollution by 70 percent in one year (further steps include alternative fuel trucks including LNG/CNG and electric, retrofits, and higher emissions standards). It’s not free though. @8: I missed that too! I guess I didn’t see the “thousands of miles” part. It makes much more sense now–thanks. @9: Banning older trucks seems very smart, but wouldn’t it just make those trucks go other places? As in, LA banned those trucks so they went to the Port of Oakland, or something like that? Would it be possible to require fleet efficiency standards, so that in order to operate in Seattle, a trucking business would have to have an efficiency level above a certain mpg and pm throughout all the ports they operate in? @10, unfortunately yes many of the trucks would just go elsewhere, though there were some incentives to actually scrap the old trucks. Also presumably grants will be extended to additional ports over time, and the Port of LA is one of the busiest. Eliminate food miles and the problem is solved. The miles associated with food include airplanes, small, medium and heavy vehicles. So it runs the entire spectrum of CO2 emmissions. Try to do anything for 2 days without eating. You will be surprised by how much time you have on your hands. One would be so bored to attempt this. Oh goody! I get to disagree with Matt the Engineer’s perspective on density and rail. Density without ‘diversity’ (economic diversity) backfires. Tall cities require more space dedicated to fewer economic elements. And this ends up requiring other essential economic elements being located at further distances thus increasing the necessity for travel and transport. Matt’s perspective on high-speed rail will increase our dependency upon long-distance travel, most of which is a luxury, an inefficiency, and a vulnerability to any disruption of that travel/transport pattern. The environmental benefit of electrified high-speed rail is moot through their mostly rural routes. Electricity for high-speed rail is better apportioned to metropolitan regional light rail where our greater need for ‘diversified’ development exists than in towering city centers. There should be no question that reducing VMT is the only solution. Toward that end, far, far more development is required in suburban settings than central cities. Towers require too much time and specialty materials to construct and too few construction companies able to build them. “And this ends up requiring other essential economic elements being located at further distances” Like what? Other than farming (requiring few people) and manufacturing (which can be set close to the tall city, connected by rail), I can’t think of a single example. “far, far more development is required in suburban settings than central cities” Please tell me how sprawled suburbs can reduce VMT. 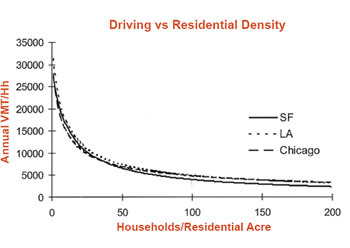 Even with strong price signals (high gas prices), without density people need cars (and parking spaces, roads, etc.) to get around. “Towers require too much time and specialty materials to construct and too few construction companies able to build them.” Clearly not, since we’ve built many of them. The number of construction companies is certainly not fixed and would grow based on demand (or even government subsidy, if you’re really concerned about this). Cities need space left unbuilt and dedicated to parks and natural area. These unbuilt spaces as much an economic element as an amenity. Filling in these spaces with high-density high-rise and all that goes with it results in the desire to travel outside the city to experience it. Suburbs have the most need for long-distance travel because of their lack of economic diversity and the least travel options. They are more economically dysfunctional than central cities, but abandoning them and returning them to nature is out of the question. A good prescription for suburban redevelopment is mid-rise mixed-use of poorly arranged commercial districts that are entirely car-centric. In totality, this sort of development is much greater than high-rise in central city. And it achieves the greater goal of reducing VMT. Most of the Seattle region’s traffic is generated in the suburbs. My position on the differences between these two development patterns stands – high-rise is specialty construction that goes up slowly and affects overall development pattern negatively. Mid-rise mixed-use development in the suburbs is likely more than 20x that of high-rise with at least that many more carpenters and masons able to perform the work. If Seattle continues to densify, this will only increase is ‘magnetic’ affect attracting people from the suburbs for work, amenities, etc, most of whom will drive. Try being a little more analytical, Matt the engineeeeer. Any work or retail center will have a “magnetic affect”. If you focus this in one location, you create physical incentives for people to move close by or at least use transit. Distributing these centers to suburbs removes this incentive – instead of a focused point with a 20 mile circle of commutable distance you have, say, a 20 mile circle of jobs and amenities with a 40 mile circle of commutable distance. Hence we get new developments in places like North Bend, and we get cars crossing the entire 40 mile circle for work or to access ammenities. I used to at Port of Oakland on air quality mitigation issues. There isn’t any one single answer to what happens to trucks that exceed mandated emissions standards for use at west coast ports. When trucks are retrofitted, the destruction of the old engine block needs to be documented; when particulate filters installed, the owner needs to keep a log; when they no longer gain access to shipping terminal maybe the haul dryage elsewhere, but not long distance; etc. Conceivably they could be transfered to ports that have lesser air quality mandates, but in reality many of these older trucks are owned by non-union, owner operators that can’t afford the upgrade and aren’t likely to move. The EPA led West Coast Collaborative is an effort to implement air quality standards for all diesel powered container movement equipment across the board so that polluting equipment isn’t just relocated and these multinational companies can have some degree of consistency regulatory framework. I would question whether those port of LA trucks are getting dumped into Mexico. Distributing retail/commercial centers to suburbs brings them closer to suburbanites who currently commute long distances. Centralizing them in central city leaves the suburbs in their current condition. Nice try. No cigar. “Centralizing them in central city leaves the suburbs in their current condition.” Decenteralizing created our current sprawl. Pay special attention to the first video. Thats how it will get done. Thanks for the detail, publicadministrator. Matt and Wells, I think you’re still talking past each other. Current suburbs need to densify and build real centers, and many are already making a stab at it via faux Ye Olde Towne Centre. Easy to mock, but keep in mind North America is full of wannabe Europe, and it brings together people and services. However, at the same time our commercial-heavy central cities are adding places to live. Remeber it’s not “city” but “cities” as in Tacoma, Bellevue, Redmond, etc. (all PSRC Urban Centers). Also keep in mind that over the coming decades we’re largely talking about new households, not relocations. I don’t think we’re talking past each other at all. I will concede that urban centers are better than homogeneous sprawl, and could even be a good working solution if you keep jobs in a central large city and connect to these urban centers via mass transit. But I believe the urban center concept is fatally flawed for the reasons cited above and creates, not reduces, sprawl. Matt. Suburban sprawl occurred because early city centers were foul with air pollution and environmental degradation. It was immediately evident that the new freeways wouldn’t handle rush hour commute, nor could transit be designed to effectively serve that travel pattern. Pollution controls have improved air quality, but only by reducing the need for long-distance commuting will traffic be reduced to manageable levels. Diversifying suburban economies with mixed-use development is a logical way structure them so that suburban and cross-county transit systems may work effectively and thus reduce county-wide traffic. Suburban commuting to city centers, your prescription for development, has been obsolete for decades. Let’s parse this statement. First, my prescription is for tall cities – both for living and working. Suburbs will exist, but will be far less attractive an option the further you get from the city. Second, “obsolete”. One would think the modern style of sprawled neighborhoods surrounding urban centers is exactly what we should be trying to get away from. I’m fine with my ideas being old-fashioned. Roll back the clock 100 years and city planners were doing a whole lot right. My beautiful walkable neighborhood was created thanks to 30′ lot lines and narrow streets, planned for density to maximize use of streetcars. I dismiss Matt’s lack of understanding regional planning principles as too ridiculous to waste time in further dispute. The economically dysfunctional suburbs overwhelm city center with traffic. Building more skyscrapers will only increase traffic. Maybe Matt the ‘mechanical’ engineer works for General Motors? That would explain his agenda. Ah, name calling. I was wondering when you’d sink to that. Who do you work for, Wells? I guess there was a little meat in your comment to refute. “The economically dysfunctional suburbs overwhelm city center with traffic. Building more skyscrapers will only increase traffic.” Traffic doesn’t bother me. It’s not the city center that’s overwhelmed with traffic – it’s the approaching freeways. And if you take a look at highways like 405 or 167, you’ll see it’s not just Seattle that’s affected. In a suburban world, life stops with high traffic – going to the store takes hours, going to work takes hours, etc. In a well planned city, cars aren’t required. Matt, Seattle city center has too much traffic travelling too fast. The freeway bumper-to-bumper during rush hours is reflected in maniacal motorist behavior there and on surface streets. You got nuthin. Your view on density and development deserves ridicule. Either make adjustments or get used to it. For the most part, I agree with Matt on this one. The idea that a suburban structure is good for the environment is hard to accept. Adding amenities to the suburbs hasn’t helped things much. Too many people have to commute from suburb to suburb now (or from the city to the suburb). A simple glance at the freeways during rush hour will confirm this. It is also extremely difficult for rapid transit to handle such a structure. Instead of a simple spoke system, or a system based on the cities (Olympia, Tacoma, Seattle, Everett) people want a rail system for their commute (Lynnwood to Kirkland, Kent to Issaquah) which is extremely expensive. On the other hand, we simply must address density in the suburbs. In many ways, the lack of density (and lack of character) in the suburbs is a bigger problem than the lack of density in the city. Lots of people simply can’t afford to live in the city, and are forced to “settle” for living in the suburbs. Obviously this can be addressed by making smaller apartments or smaller houses, but the same thing should be done in the suburbs. The choice of big houses and big lots should be discouraged everywhere — not only because it is hard on the environment, but because it leads to less desirable neighborhoods and makes the desirable neighborhoods more expensive. As to the topic at hand, electric cars are unfortunately billed as the appropriate car for the most inappropriate use. They are often called “city cars” or, if they have a bit more range, “commuter cars”. City driving and driving as part of your commute should be eliminated. This is something that a good public transportation system can (and should) provide. On the other hand, driving to rural areas makes sense. It is very difficult for a public transportation system to provide that sort of convenience. If I decide to go for a hike, I wouldn’t expect to take a bus (unless it is a very common spot). In an ideal world, the cars would be parked on the outskirts of the city, but I don’t expect that to happen anytime soon. In any event, since electric cars have limited ranges, they aren’t likely to be popular for rural uses. For urban uses, it makes way more sense for us (as a society) to spend money on improving public transportation instead of subsidizing electric cars. Oh, and someone mentioned rail. Here is my favorite link on the topic: http://www.theoildrum.com/node/4301 As that article points out, the fuel efficiency gains start to diminish after you get above 110 MPH. Thus, the plane, even in a very fuel efficient society, still makes a lot of sense (at least for this country). Maybe this element should go in the upper list. The way I look at it, there are two ways to drive/expand the ‘green’ elecity market – 1) expanding supply through research, infrastructure investment, gov subsidies, and such, and 2) expanding demand for green electrons through mechanisms such as C&T, some offset programs, full-cost accounting, etc that will stimulate supply expansion. Since ‘green’ sources are generally pretty price-competitive and don’t present the highest of barriers to construction, I would think that supply would be pretty elastic/responsive to a rise in the market price for electricity and especially responsive in so far as we can maintain two electricity markets, one ‘green’ and the other ‘dirty’. I find this pretty congestion can drive up the demand for transportation alternatives or in an information-poor market, drive up the demand for more of the same -> roads. Ross, I picked a fight with Matt because he has been insulting dismissive of my viewpoints even though I always incorporate some moderating aspects. I have explained my positions many times on these forums and believe you should hear an argument against electrified high-speed rail and one for electric cars. First, the nation’s worst traffic problems by far are within metropolitan areas and inner-city, not intra-city traffic between distant cities. Electricity should be dedicated first to light rail and other electric transit. Most high-speed rail need not be electrified nor achieve speeds exceeding 100mph. Air travel is a luxury that will eventually become too expensive and less commonplace than it is today. High-speed rail will still serve travel markets under 500 mile distances, but through mostly rural routes, the environmental benefit of electrification is moot. Second, downtown Seattle will always have vehicle traffic, even if it is one day mercifully reduced to a sane amount. Downtown air pollution can only be reduced via electric propulsion. Electric propulsion is also inherently safer because the ‘flat’ torque curve of electric motors is not designed for accelleration. Battery weight lowers vehicle center-of-gravity to improve stability and handling. I favor plug-in hybrids rather than battery-electric and hydrogen fuel cell for many reasons. The latter are designed to maintain current driving distances, whereas the plug-in hybrid has a more ideally limited driving range of 10-20 miles on battery alone. This constitutes an economic incentive to drive less, patronize local economies and guide future growth along develop patterns that encourage walking, bicycling and transit. The truly ’smartest’ electrical grid must include storage at household level. The plug-in hybrid battery pack is half the size of an all-electric vehicle, and this smaller size is a better match for rooftop photovoltiac solar panels. This back-up household power arrangement will prove invaluable in a grid failure, will store surplus grid electricity generated overnight, supply power to the grid during peak demand in the afternoon, offer households the means to more closely monitor electricity consumption, and give them the choice whether to drive or cut utility bills. It leads to driving less and using less electricity at home, a win-win. When car batteries reach the end of utility for propulsion, they can supply some household use. This argument compliments advocacy for electric light rail systems and guiding regional growth along the lines that PSRC should be following, but aren’t in my opinion. Well, let’s hope 2010 holds more progress than 2009 and not forget how the Bush years were a disaster not to be repeated. I agree. The argument for high speed electric rail (for both freight and passenger travel) is not made based on traffic concerns. Please read that link I mentioned. It is long, but is based on a lot of sensible studies. I will say this, though: for the greater Seattle area, if you eliminate 90% of the city to city traffic (Olympia to Tacoma, Tacoma to Seattle, Seattle to Everett) then a huge chunk of I-5 traffic goes away. Seriously, talk to anyone who lives in the South Sound area — they will tell you that it takes forever to go up to Seattle. I’m not sure if this is where we can get the best bang for the buck. I certainly believe that we should invest heavily in rail and other forms of mass transit, but we have to acknowledge that in most cities, this is really, really expensive. Even the second biggest city in the country is taking baby steps towards a rail system (despite the fact that it was built on one) because the land is so expensive. On the other hand, a good intra-city network (again, for freight and passengers) is relatively cheap. Also, keep in mind that a really good rail system can lead to sprawl. This is why it makes sense to pair it with proper land use management (Portland is a good example of an attempt to do this — I have no idea if they are successful). Without the land use part, you can get lots of people moving to the suburbs because it isn’t a bad commute anymore. Then they drive around town, decide to build more office parks nearby and guess what, you’ve got a sprawling mess with lots of traffic (parts of Chicago are like that). I think there is great benefit to rail electrification (as that article points out). I agree with you about the speed limit. Between 80 and 110 MPH seems to be a good number. 80 because it is faster than a car — 110 because the energy costs start getting really bad after that. Keep in mind that it will be difficult to get people out of their cars unless it is faster (number one reason people don’t ride transit: “it is slow”). One hundred miles an hour does it (“Be in Portland in less than two hours”). Sorry, I have to disagree with you on a couple of points. I don’t think air travel will become a luxury. I think it always be popular for travel from one coast to another and from one continent to another. I do agree with you about distance under 500 miles (although I would probably put that number at about 300). I disagree with you most vehemently on that last sentence. The environmental benefits of electrification are less energy use (and ultimately, less C02 as we transition to non CO2 forms of electric generation). With regards to smog, I agree with your statement completely. However, when you consider the bigger impact on the environment, then the case for electric rail is a very good one. To be fair, the benefits of a better rail system would be big, just not as big as a better, fully electrified rail system. Again, it seems you are worried about smog, and not about global warming. I don’t like smog, but we’ve pretty much solved that problem, with strong emission controls. I would put “smog caused by cars downtown” to be problem number 67 on my list of things to worry about. OK — I wish the buses were all electric, but that only raises the issue to about 45 on my list. As far as acceleration and electric motors though, I’m afraid you are wrong. I can get an all electric car that would blow the socks off of a Ferrari (for thousands less). Unfortunately, I wouldn’t be able to drive the thing to Portland (without stopping and recharging several times). Of course, that is the point you make in the rest of comment and I agree completely. The time it takes to recharge is a very big detriment to owning a pure electric. On the other hand, a hybrid like the Prius is a great car — plugging it is just gravy. Actually, to be fair, I believe the rest of your comments point out the tricky nature of any transportation change. A short distance all electric car seems like a waste of money if you don’t really need a car (because you live in a city that is not dependent on cars). Maybe it is better to spend that money on transit. On the other hand, such a car pushes people to live closer to town (“I found a nice place in North Bend, but my little Leaf can’t make to Seattle from there, so I bought a place in Bellevue”). Your last paragraph sums up the differences in our point of view, Ross. The short-distance electric car IMO encourages shorter drives which in turn influences development that makes driving less necessary, walking and bicycling more convenient, and mass transit more practical to arrange. Likewise, the advantage of short-distance trips applies to light rail more than high-speed rail. High-speed rail attempts to make long-distance trips bearable. Light rail attempts make short-distance trips possible. Light rail is more productive for guiding (re)development of suburbs where the need for long-distance driving is greater and travel options more limited than in central cities. Olympia, Tacoma, Seattle and Everett have a long-distance travel demand that cannot be met with high-speed rail, electrified or not. 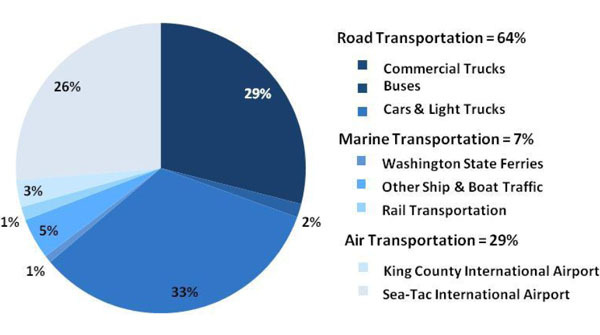 Reducing this travel demand (say between Tacoma and Everett) is more possible with light rail because it can improve the local economies of many more stations. In short, you and Matt are wrong, Ross. You bought an electric car designed to maintain a long-distance driving pattern. Your choice of vehicles encourages development of park-n-rides rather than corner grocery stores and local employment opportunities. I’m sure stockholders are very happy with your purchase. Wells: You must like confrontation, or maybe you have trouble reading, or maybe you are just extremely arrogant. I just don’t get it. I write a note that very clearly expresses the possible advantages and disadvantages or a particular approach (and, in the process, suggest that you make a valid point) but you say that “Matt and I are wrong”. I’m not sure how we are wrong. Am I wrong in agreeing with you (as I clearly did)? Or maybe I’m wrong in thinking I can have a civil conversation with you, where we can find common ground. If that is the case, I definitely agree with — I was wrong. As to me buying an electric car: I’m afraid that is a factual matter, Wells, and not a matter of opinion. I have never bought an electric car. You are clearly wrong. Well Ross, you’re wrong to focus on my one comment with the least substance. I could’ve wrote something like “Here’s the other side of the argument,” but chose to be confrontational. You also wrote, “But my little Leaf…” which indicates you bought one of those Nissan battery electric cars, but whatever. Our differences on these issues are not insignificant. I favor light rail because it should influence 10x as much mid-rise development of station areas than high-speed rail would influence with high-rise development in city centers. Just remember that I’m pro-rail and for necessary development that incurs the most preservation, restoration, pedestrian and transit-oriented local economies. I’m not anti-rail nor anti-government. I believe my standards and analysis are higher and more comprehensive than most people care to admit. It does piss me off a little that I’ve been marginalized by other transit advocates for years. And, Seattle is still regarded as backwards in its transportation system planning. One last jab: the Deep-bore tunnel is a horrendous mistake. Or all of the above. Wells, who also goes by “Sirkulat” and “Art Lewellen” loves confrontation and insulting people. He does it on just about every blog or forum dealing with transportation from Hawaii to Seattle. He occasionally has an interesting idea, but deals with disagreement by having a temper tantrum, calling people names, and then making up a story about how he’s been blacklisted or marginalized. I don’t like confrontation as much as feel it’s necessary when important perspectives are casually and insultingly dismissed by people like Jay. Sure, I lose my cool too often, but the stakes are high. I won’t stand by while ‘trolls of the Left and Right’ malign my character, stifle honest debate, and so many cities become more and more overrun with traffic. Feel free, Jay, to contribute actually substantial viewpoint in this critically important debate. So far, you’ve added nothing. Just to clarify the “little Leaf” statement, I was actually making it to support your argument. Not that I completely agree with your argument, just that I thought that part of it was interesting and worthy. I don’t think the Leaf is available yet, and I put the statement in quotes to suggest that someone might think that way. I guess that wasn’t clear (I’ll admit it isn’t the best way to paraphrase things, but I’m not sure how best to do so). When the Leaf comes out, I probably won’t buy it (too expensive and too limited a range — the main reason I live here is because the hiking is good). My big point (with all of this) is that it would be a big mistake to assume that one approach is way more important than another. There is no silver bullet. A lot of folks assume that if we all drive electric cars, then the world is saved. They ignore (or are simply ignorant) of the fact that car transportation is only a small part of what is causing global warming. That doesn’t mean that electric cars are a bad idea — far from it — it just means that we have to look at them along with everything else. One of the issues with electric cars is that the batteries are expensive. That drives the cost of hybrids up. Assuming a limited number of batteries, does it make sense to have X numbers of cars run on batteries, or Y number of hybrids. I don’t know the answer, but that is an important question. Personally, I would rather put the money into public transportation (I’m pretty sure we can get more bang for the buck that way, but I would like to see some studies). Likewise, I think it is a mistake to just focus on light rail and assume that it will solve our problems. A lot of folks want to travel further than light rail can efficiently accommodate. What happens then? They either drive, or work somewhere else. What happens if they work somewhere else? That hurts our economy and hurts those locations. Eventually, Kent or Federal Way get more people in it than Tacoma. So, instead of people living in tight, urban locations (like Seattle, Tacoma, Olympia, Everett) they live in sprawling spots that aren’t “too bad a drive” (oops, there I am again with the quotation marks for a third party hypothetical statement). Oh, and I’ll still defend my statements about high speed electrified rail as being very important. The guy who wrote that article has done his homework. He addresses not only high speed passenger travel, but the important issue of freight (which is responsible for a huge amount of our global warming problem). Urban/suburban transportation, Ross, comes in four basic modes: cars/trucks, mass transit, walking, bicycling. An electric car is still a car. Both present a severe an impediment to the adequate function of the other modes. And when ‘travel by car’ dominates, cars present an impediment to their own adequate function. You’re correct that mass transit is the better investment, especially with Seattle’s traffic-clogged roadways. But to adequately incorporate walking and bicycling into the transportation modal mix, the land-use and development aspect comes into play. More destinations must be located within convenient walking and bicycling distances. Toward that end, the development patterns of suburbs are poorly arranged and have by far the greater need for redevelopment. Seattle has a population of what, 500,000? The Seattle metropolitan area however is 6x that, mostly located in the suburbs surrounding small Town Centers whose development pattern cannot serve nearby residents basic needs, thus the resulting cross-county commuting. In short, the suburbs have more need for development than major cities. Bypassing the suburbs with a high-speed train only addresses the lesser problems of traffic and land-use. Think about how the proverbial ‘market’ would be affected if within the Seattle metropolitan area 40 or so (currently hideous) Town Centers became economically more self-sustaining, self-sufficient communities. It’s likely the ‘market-driven’ high price of living downtown would be driven down, way down, because competing suburbs would house more people and offer more employment opportunities, all the while requiring the least amount of expenditure on travel. Long-distance travel (as we know it) is passing away, never to return. On top of that, there’s the apparent social shift among younger people leading to “peak car”. I have to say I’ve witnessed a lot of texting on the bus and rail. Unfortunately there may be just as much going on in cars. Your idea is really a breath of fresh air when compared to the typical junk I read on solar technology. Several frauds around. Thanks for helping me out. This valuable page was very fascinating to look over, I appreciated it considerably. I am going now to e mail it to my collegues to permit all of them read this too. Thank you incredibly. Lot’s of interesting information in your blog, comments, and admin response to comments…thank you for that. Any trucks that are taken out of service are never going to have their engine blocks seized up unless the truck has other issues that doesn’t make it economical to send the truck to auction and put it into use somewhere else. To ensure a good car transportation we should research for a car transport in online such that we find a good company for our transport. Nowadays many new features have been added like the electric cars which can be travelled by itself. Wow this is one of the great idea and just wanted to see these type of cars as soon as possible.. Check out my website and see how much you can save. PPC advertising is very popular these days because of Google;;. Useful blog a considerable amount of advice on pests. I have happen to be doing some analysis and have come up with yet another beneficial web site to take a look at. Http://getthebee.com has great info for billing and invoicing for small businesses. Seattle could become one of the innovative cities that not only talks about reducing the carbon footprint but becomes active! Once the electricity is produced “green” as well and the recycling managed then it will be phantastic and improves the quality of life in Seattle alot! People will be able to breath more freely! The thing that I miss most is layout tools comparable to what I get in java, flex or even good old Delphi (border layout, grid layout, flow layout, …). I get that CSS is meant to style single-column documents, and for that it is great, but the reality is that web 2.0 is not built out of single-column documents. My coder is trying to persuade me to move to .net from PHP. I have always disliked the idea because of the expenses. But he’s tryiong none the less. I’ve been using WordPress on several websites for about a year and am nervous about switching to another platform. I have heard excellent things about blogengine.net. Is there a way I can transfer all my wordpress posts into it? Any kind of help would be greatly appreciated!